Home » Miscellany » Braves Say AAA Team Will Remain in Gwinnett Co.
(From Sports Business Journal, November 18, 2013) The Atlanta Braves are planning on moving to Cobb County and hope that this move will go much better than the move to Gwinnett County by their AAA affiliate team. The Gwinnett Braves move in 2009 got off to a rather rough start. The team moved from Richmond, Virginia to one of Atlanta’s northeastern suburbs hoping to take advantage of the market’s north side population increase and to create a missed-use development surrounding the park. 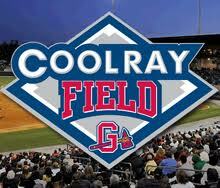 Unfortunately the missed-use development around Coolray Field, where the Gwinnett Braves play, has not happened. The park opened in the beginning of the recession, and of the five seasons the team has played in Gwinnett, the team at best has been 12th in attendance in the 14-team International League. With the Charlotte Knights planning to move to a new park next year, the Gwinnett Braves are expected to rank 14th in attendance in 2014. While things seem rather unfortunate for this ball club, the Atlanta Braves club says they remain firmly committed to the team.